Not long ago, I did an article on twelve realistic reforms the Catholic Magisterium could implement right now that would put the Church on the way to authentic reform. One friend opined that this article, while interesting from a speculative standpoint, is ultimately useless, because it means ultimately waiting for the Magisterium to do something. This friend suggested that reform was much more feasible at the parish level and encouraged me to look at ways that reform could be implemented from the bottom up. Ultimately, my earlier article was nothing more than an intriguing thought exercise. This one, however, I propose as an actual model for how your typical, wishy-washy Catholic parish, under the administration of a properly disposed priest, could transform itself into a real bastion of orthodoxy and spiritual renewal. To that end, these twelve steps for parish reform are directed primarily at priests, specifically, young priests coming into a new parish where love for tradition has not hitherto been fostered. Thus, this post is aimed at a traditional-minded priest in a non-traditional Novus Ordo parish. The parish perhaps has a modern layout; Masses may have been characterized by guitar music and dull homilies devoid of any meaningful content; Eucharist is shoved off into a side chapel. You know the sort of place. One last thing: while my previous post offered twelve suggestions in no particular order, these twelve are ordered sequentially, so this is my proposed order in which these reforms ought to be implemented. I know some will say to hell with sequence, do it all at once and be done with it, but we have to take into account our present realities and remember that our goal is to convert and sanctify lukewarm souls, not drive them out of the Church and turn the parish into a traditionalist enclave. While there are certain practices that should never be tolerated, there are other things that sometimes have to be let go for the time being to focus on larger issues. I propose a timeline of a year to two years for implementing all of the changes I describe below; some will happen parallel to others; some can be done at the priest's own initiative, others will require some planning and help of others, but all can be done and none are unrealistic. 1) Restore the Tabernacle to the Center of the Altar and Move the Altar Against the Wall: In most parishes which feature a table altar and a portable tabernacle situated in a side chapel, this would not be physically difficult to do. It can be done at the priest's discretion and can be the occasion of some catechesis on the Eucharistic sacrifice, worship ad deum, and the ends of the Mass. It need not take long, either. Announce it one week, do it the next, and preach on the above mentioned topics for the following two Sundays. Done. As for that old side-chapel, turn it into a Marian chapel, perhaps with an image of Our Lady of Czestochowa or Guadalupe within and promote it as a place for communal recitation of the Rosary. Mass ad deum with a tabernacle on the altar should be the first thing. Also, if the parish has a "Resurrectifix", this should be replaced with a legitimate Crucifix immediately. 2) Hire a Music Director Competent in Chant and Immediately Replace the "Entrance Hymns" with Chant, as well as "Communion Hymns" with Chanted Introits and Communion Antiphons: This, again, is within the pastor's discretion. It does not get us entirely where we need to be, but it introduces the congregation to Gregorian chant, promotes the practice of silent reflection and prayer during communion (since they will not sing along to the communion antiphon) and still allows them a few "hymns" to sing so the transition isn't so abrupt (the so-called "Offertory Hymn and the "Closing Hymn"). The Music Director should also work in conjunction with the pastor to throw out whatever junk hymnal the parish is probably using and replacing it with something much more traditional. 3) Preach the Sacrament of Penance: In most Catholic parishes, the sacrament of penance is under utilized, a fact which is reinforced by the priest's refusal to preach on it, publicize the sacrament, or insist that his flock make use of it. If, however, the necessity of penance is preached and confessions are made available, it is proven that people will go. Confessions should be made available at least two days a week, but ideally more, and for at least an hour and a half to two hours. Remember, "My people perish for lack of knowledge" (Hos. 4:6). 4) Weekly Exposition and Benediction of the Blessed Sacrament: Parishes that have had the sacrament relegated to a side-chapel are usually not big on Eucharistic devotions. But, since the Eucharist is the heart of the faith, any restoration of faith must be accompanied by Eucharistic devotion. At first the bodies will not be there for a 24 hour exposition; that's alright. Expose around 5:00pm on Friday and do Benediction at 7:30pm. Exposition-Benediction also provides the priest with a little "laboratory" in which to test out Latin hymns and prayers on a smaller group of faithful without having to do so to the entire congregation. It gives the priest an idea of how difficult it will be for his particular flock to make the transition to Latin, and furthermore will identify the folks within the parish who are most sympathetic to traditional prayers and devotions. These folks will be the bulwark of his efforts. 5) Promote Marian Devotion: Heretics and progressives hate the Blessed Virgin Mary; and no wonder, for the DeMontfort prayer of total consecration says that Mary is the destroyer of heresies throughout the whole world. Promotion of Marian devotion, besides inculcating an appropriate love for our Blessed Mother, has the pedagogical effect of instilling in the faithful a lively awareness of the role of grace in the spiritual life. Hence, it can serve as an antidote to the prevalent activist, good-deed focused "Pelagianism" we have been hearing so much about lately. The kind of Marian devotion may vary from place to place; Rosaries after daily Mass, led by the priest, devotions to Our Lady of Perpetual Help on Tuesdays, May Crownings, enrollment in the Brown Scapular, offering the Total Consecration yearly, accompanied by appropriate homiletical catechesis on Marian devotion. The opportunities are numerous and the benefits vast. 6) Promote a Very Active Food Pantry: While most parishes have a food bank of some sort, very few have a really active food pantry. The parish priest should strive to instill a love of service in his people, but out of a sincere love for God and neighbor grounded in devotion to Christ, not any misguided humanist values. The parish food pantry should be a center of assistance for the poor, and the parish should cultivate a reputation for charity and care for body and soul. The priest can also use this as a means to catechize his people on how the corporal and spiritual works of mercy are meant to compliment each other and not be in opposition. 7) Adopt an RCIA Curriculum that Nourishes the Intellect and Spirit, not the Emotions: RCIA programs in most parishes are abysmal. Direct your RCIA instructor or DRE to transfer to a program that focuses more on intellectual and spiritual formation and less on sharing of experiences. This, besides being more in keeping with the Catholic Tradition, will make the RCIA experience richer for your catechumens and will actually result in more converts over time and of a better quality. If you don't know where do get good RCIA materials, you can begin here with Unam Sanctam's free RCIA notes and outlines. 8) Preach the Hard Stuff: While parishioners don't need to be beaten over the head with dense Thomistic homilies or theological ruminations about the procession of Persons within the Trinity, the priest ought to maximize the power of the pulpit by preaching on subjects that people desperately need to hear: the uniqueness of Jesus Christ, the reality of sin, the life of grace, the inevitability of judgment, the holy examples of the saints, the reality of angels, the necessity of entry into the Church, etc. I would also highlight the intrinsically disordered nature of homosexual acts and the incompatibility of active homosexual lifestyles with Christianity, as well as the unfittingness of homosexuals for the priesthood as required preaching. 9) Offer Your Parish Facilities to a Homeschool Group and Encourage Homeschoolers: You want to see your parish explode with vibrancy? Offer your facilities to the use of a local homeschool group of co-op, offer to say Mass for them once or twice a week, and let word get out that your parish is friendly to homeschoolers. Then just sit back and watch what happens once this leaven is added. 10) Pray the Eucharistic Canon in Latin and Teach the Congregation the Mass Parts in Latin: After the congregation has gotten used to hearing Latin in the Introit and Communion Antiphons, introduce them to it in the Eucharistic canon. Then, week by week, or maybe month by month depending on the degree of skill and/or resistance, teach them the Mass parts in Latin. Don't be apologetic about it; don't feel like it needs to be explained or beat to death - just be nonchalant; take the approach of, "This is what the Church, the popes, and Vatican II have asked us to do, so we're going to do it!" Though not strictly related to this, since we are talking about the Eucharist, I would also recommend dismissing all of the Extraordinary Ministers. You simply do not need them, and you are not doing anybody a favor by keeping them all around for fear of hurting somebody's feelings. And while you are at it, do whatever you can to restrict altar serving for boys; I say "do all you can" because in some dioceses the bishop specifically orders that girls be allowed and will not permit priests to dismiss female altar servers summarily. Do what you can. 11) Beautify (or De-Uglify) the Parish Sanctuary: After the priest has been there for awhile and the congregation knows what sorts of things to expect from him, it is probably time to look at raising funds for replacing those ugly, modern minimalist colored glass windows with some traditional stained glass. How about replacing the bland wooden pulpit with an ornate marble ambo? Begin a donor campaign to replace modern, cushy, kneeler-less pews with something more traditional that includes kneelers. Tear the carpet out of the sanctuary area around the altar and replace it with hardwood, tile, or marble. Consider purchasing some more ornate vessels. Or, funds and architecture permitting, get some communion rails. You don't need to use them right away. You can just install them for aesthetics and begin using them whenever you are ready. It also enables you to offer the Extraordinary Form. 12) Offer the Extraordinary Form of the Mass at Least One Sunday a Month and More During the Week and on Feast Days: Benedict XVI predicted that the broad availability of the old Mass would spill over into the celebration of the Novus Ordo and that the NO would thereby be enriched by the EF. Ultimately, this is where the whole restoration of parish life tends toward: the engagement of the faithful with the Mass of Ages, which will eventually lead on into whole new levels of spiritual growth and maturity if done properly. 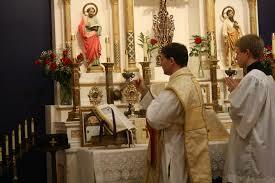 Growth in holiness through the Traditional Latin Mass. Do you have your own suggestions? Please add them in the combox! And check out this series of articles on how parish renewal was brought about in a formerly liberal parish in Ann Arbor, MI. All wonderful ideas. Unfortunately, I think that many priests who tried to implement them - particularly 8 and 12 - would find themselves called to the chancery. "You know Father, the mental ward downtown needs a new full time chaplain... oh, I'm just saying." Can you edit this? I would like to show this to others and this would make it come off bad. Woops...sorry. That must have been a hold over from the draft/bullet point outline. I seldom proofread my articles before I post them. It's corrected now. It was genuine...from a genuine rough draft. Sorry, but in 80% of the parishes in my diocese, # 1, #8, and #10 would have "progressive" parishioners up in arms in the Chancery and you would be summoned to the Office of the Bishop and told that you were being divisive and lacking in pastoral sensitivity. If the complainers were big donors, you'd probably be transferred and not given a pastorate in the replacement. All great suggestions! Might I add a listing of mortal sins , upon entering or little pamphlets at entrances, to prick consciences, that to receive Our Lord in Holy Communion is a sacrilege with mortal sins on one's souls. Not only is Hell not spoken but serious sin is never either. The poor priest who does it will be banished for life in east Timbuktu. Thank you for your courage to propose these steps. I have 3 that have also been on my mind. In addition to strengthening RCIA, include all catechism classes using faithful materials, and priestly visits to classes. Instruction and strong encouragement and involvement by the priest for altar boys. Our parish allows every boy to serve from age 4 to 90 at every Mass they attend. It does require great organization,. Lastly, kneeling while receiving our Lord in ?Holy ?Communion, and use of Extraordinary Ministers only when needed. Instinction makes this feasible. Thank you for your courage to propose these steps. I have 3 that have also been on my mind. In addition to strengthening RCIA, include all catechism classes using faithful materials, and priestly visits to classes. Instruction and strong encouragement and involvement by the priest for altar boys. Our parish allows every boy to serve from age 4 to 90 at every Mass they attend. It does require great organization. Lastly, kneeling while receiving our Lord in Holy Communion, and use of Extraordinary Ministers only when needed. Intinction makes this feasible. I agree that #1 should be first, but number 2 has to take a back seat to #4. And #8 has to be moved up. So I'd go with the Eucharist first. Then SILENCE IN CHURCH at all times, out of reverence for the Lord. make the congregation realize that church is different, and worldly behaviors are not acceptable. The start to preach the hard stuff via catechesis. The Real Presence, Who Christ is, and what is He saving us from, and the obvious sins, theft, lying, adultery, murder. Then go to the ones that start to sting.. promiscuity, drunkeness, the finally the ones that people will have a cow about Contraception, divorce, voting for pro-abortion, pro gay marriage candidates. Start to use Latin in the various parts of the mass, a bit here, a bit there, but not every time, just as a variation - one that becomes more and more common. Then start Chant. Remember, you may have to fire someone to do this. This will cause a lot of disruption, but you can foresee this and prepare for it by getting the current guy to do more reverent music. When he complains and pushes back, then you can can him, and the person who replaces him just happens to do Chant. Then some masses ad orientam, and so on. My purpose in this is that the priest can create major changes that the Bishop can't really object to. But imposing chant or ad orientam worship is sure to generate complaints and transfers, so should be done after the laity are already advanced in "formation." Archaeologism, Mithraism, Labor and More on USC!